Could Shaka Smart look at a lineup with Jericho Sims and Jaxson Hayes together? Friday’s game against Radford marks the start of a six-game homestand for the Texas men’s basketball team. The 17th-ranked Longhorns should be favored in most, if not all, of those matchups. Purdue may have something to say about that on Dec. 9, though. 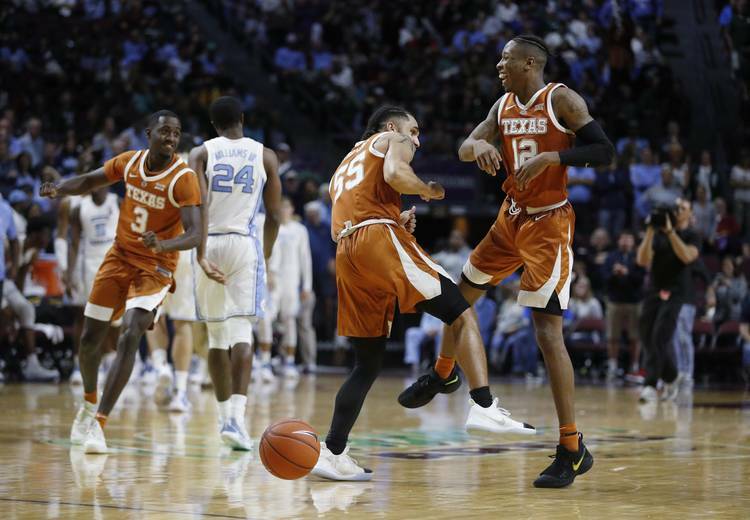 Texas players weren’t overjoyed with a split decision in games against North Carolina and Michigan State in Las Vegas during Thanksgiving week. If anything, it gave the Horns a real-time look at just what this roster is capable of. “There’s some real humble pie that should come out of those games,” UT coach Shaka Smart said. Texas (5-1) has only one mission throughout December. “I think the biggest thing for us is keeping our foot on the gas,” guard Jase Febres said. After Friday’s game, Texas hosts Virginia Commonwealth next Wednesday, then Purdue on Dec. 9, Grand Canyon on Dec. 15, Providence on Dec. 21 and UT-Arlington on Dec. 28. Then Big 12 play begins on Jan. 2 with a road trip to Kansas State. School officials are trying to gin up more fan interest. Starting Friday, the concession stands will offer $3 soda, water, candy and popcorn. Fans can buy $5 domestics and $6 premium beer in the 90 minutes leading up to tipoff. Bevo Boulevard, a raging success during football season, will make its basketball debut on Dec. 9 for the men’s and women’s doubleheader. The UT women host Tennessee at noon, then the men play Purdue at 5 p.m.
Getting Sims going: It’s not easy going from the backup to the starter, as sophomore Jericho Sims has discovered this season. He’s averaging 5.7 points and 4.7 rebounds while getting almost 21 minutes per game. Smart said earlier this week there is no plan to swap Sims for freshman Jaxson Hayes in the starting lineup. But what about playing both? Sims said he’s been practicing alongside Hayes. That could be an eye-popping combination of athleticism. Keeping Febres on target: It cannot be overstated how critical it was for Febres to sink four 3-pointers in the second half against the Citadel. With a shot of confidence, he hit some key buckets against the Tar Heels before sinking back to only two points against the Spartans. Febres admits he’s probably not going to get his shot blocked. Now, it’s a matter of finding that consistent rhythm. Passing lanes: Smart judges his team’s performance on three key areas — deflections, free-throw shooting and 3-point shooting. Texas has forced an average of 20.3 turnovers in the last three games. That’s led to more run-outs and easier buckets in transition. Texas scored 32 points off turnovers against the Citadel and then 31 more off turnovers against North Carolina. Smart said the Horns had 11 deflections in the first six minutes against the Heels. That’s a big reason how they dug out of a huge first-half hole. Now, Smart just wants them to think about defense and transition all the time, not just when things are clicking. “For us, it continues to be about building habits,” he said. Build confidence: Texas is likely to pile up victories and have a solid overall record by the end of the month. The Longhorns just can’t be lulled into having false confidence.